For my husbands birthday I surprised him with a two day honeymoon to the 3rd romantic city in the world Carmel-by-the-sea, California. You see we got married in less than a week, and immediately packed up our belongings to move to the United States. We never did have a chance to have our honeymoon, so I took it upon myself to book a small one for us. The only thing I told him leading up to his birthday was to clear his weekend schedule, something I knew would prove to be difficult. Imagine an unplugged weekend where you reconnect with your loved ones. A beautiful place where the entire town shuts down at sunset and is completely quiet. Street signs, and store fronts made from wood, no street addresses to get to a place, just the customized names on houses or businesses. This is Carmel, a welcoming and friendly atmosphere from everyone who was visiting and living there. The incredible pacific coast line was simply breathtaking. 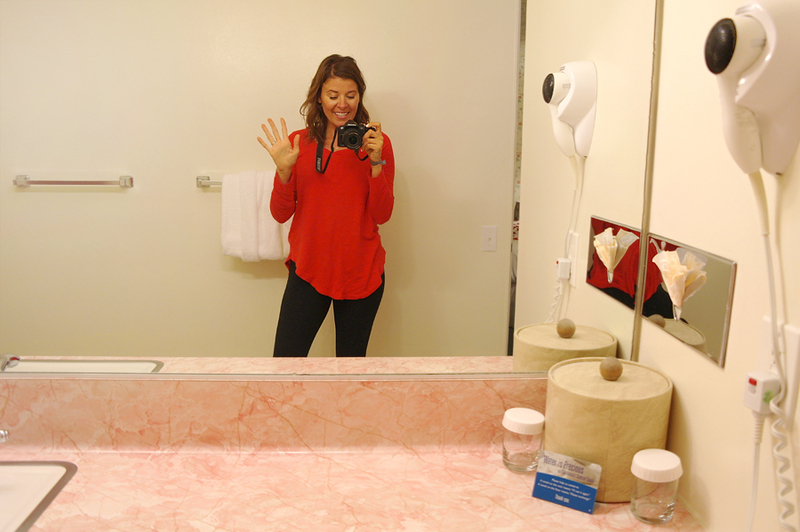 Today, I’m taking you through our trip and stay at the Hofsas House. 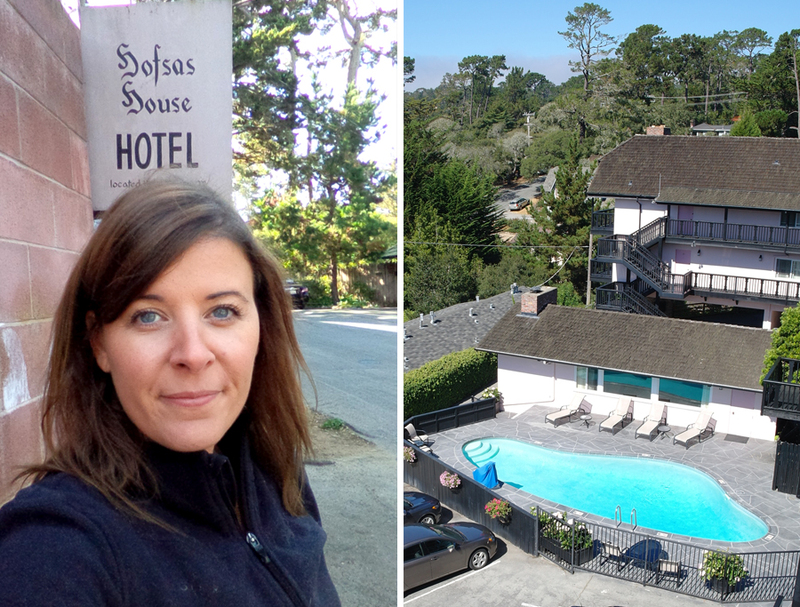 We called Hofsas Hotel in Carmel-by-the-Sea our home for the past two days. The location of Carmel-by-the-sea is about a square mile on Carmel Bay. 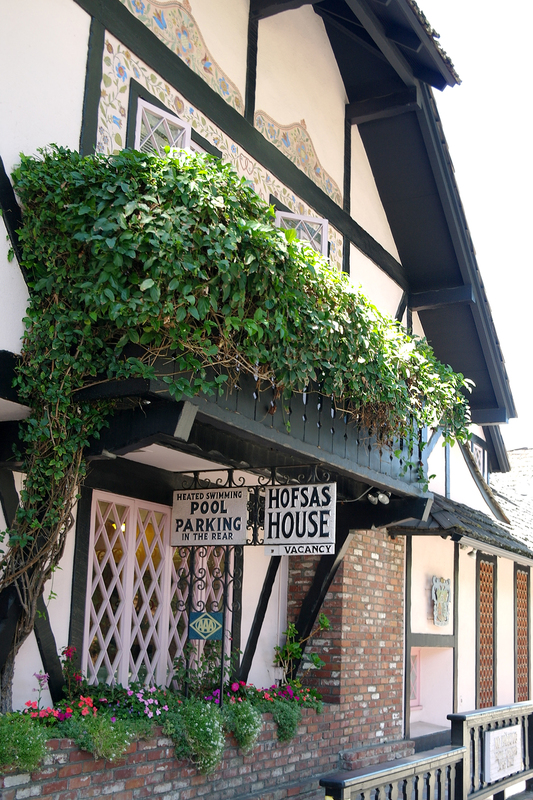 Hofsas House is walk-able to Carmel itself, where it has many boutique stores to meander through, a diverse selection in restaurants and wineries, everything in walking distance. Once we collected our room keys and walked in through the pink dutch doors, we were taken back by the hospitality. 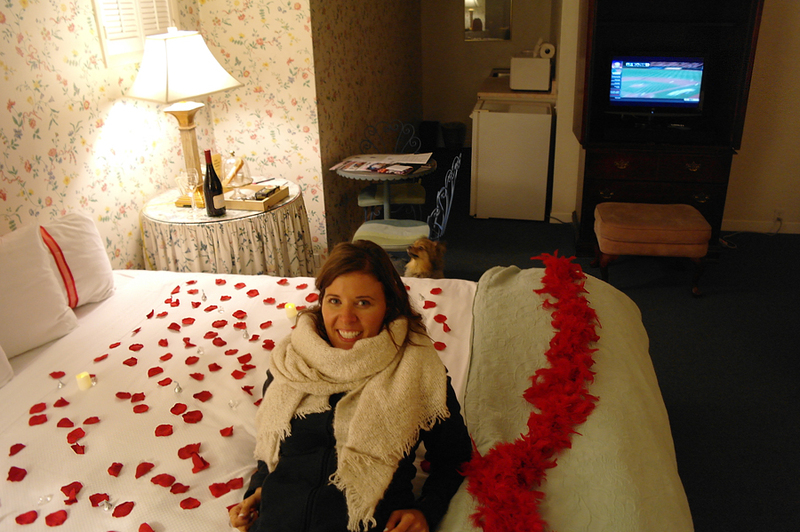 Our room was completely decorated into this romantic honeymoon suite with rose petals, fireless candles and Hershey kisses (an added upgrade guests can request for a fee) with a massive king sized bed with treats and a dog bed off to the side for Alfie. 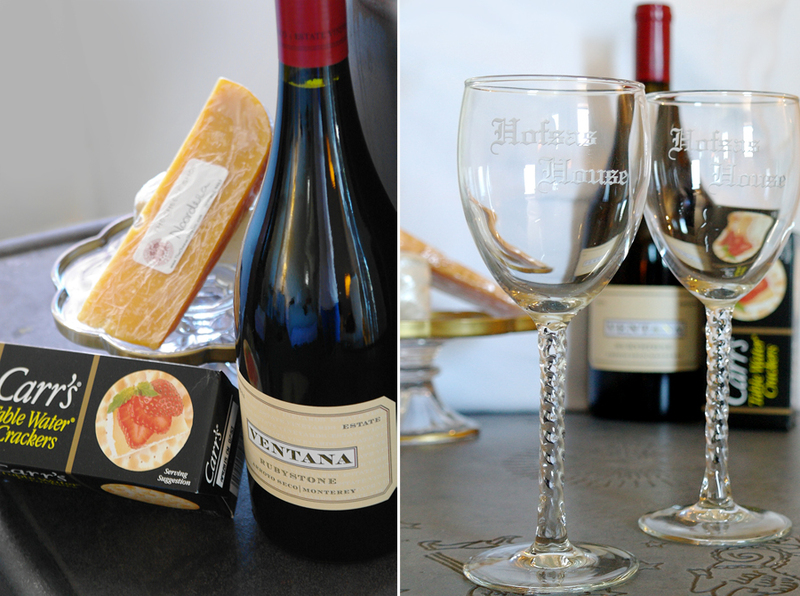 On our bedside table there was a bottle of wine and a cheese platter from The Cheese Shop, which guests can order to their room for $30. Talk about a warm welcome, hey? The three of us (Alfie came too!) took off for this two day weekend to explore this town for the first time. We have heard a lot about this place and its beauty. We were welcomed with open arms, even after arriving an hour later than anticipated due to traffic, from the charm of the Hofsas House, which is in its 3rd generation of the family run business. We had about an hour to get ready for supper at The Grill when we arrived. Perfect time to re-curl my hair, swap out my cozy clothes and change into a silkier blouse and skinny jeans for our date night. Carmel is much cooler at night, so we took advantage of our in-room fireplace and had a cozy fire each night. 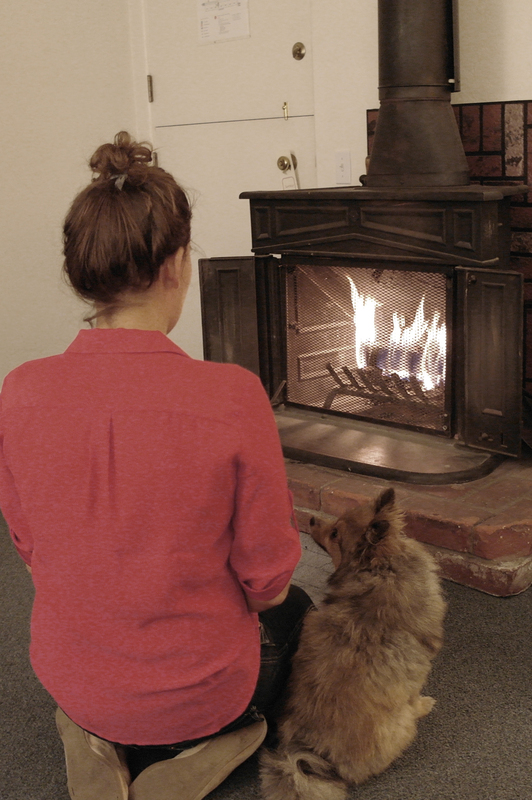 There’s nothing quite like sitting in in front of a warm evening fire. 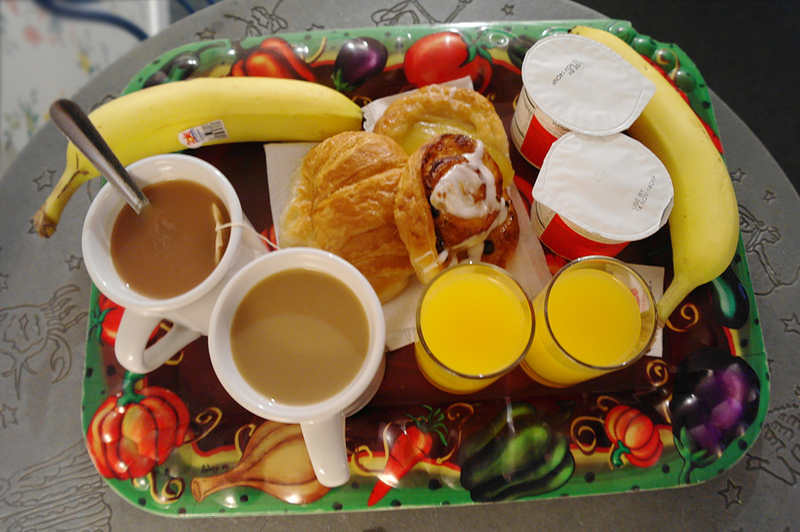 There were trays available if we wanted to enjoy our continental breakfast in the comforts of our room. 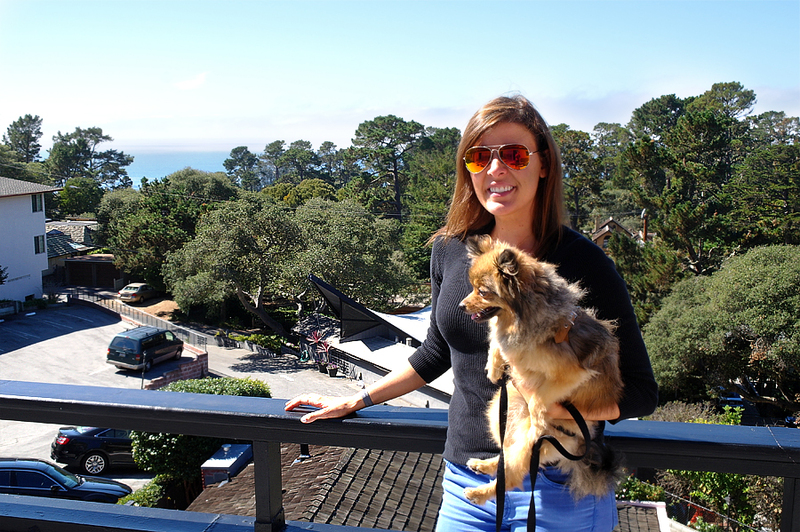 Carmel is known for being incredibly dog-friendly with tons of restaurants catering to your pooches. At Hofsas House, not all rooms are dog-friendly but the ones that are take special care and go the extra mile to make your family pets feel much more at home. 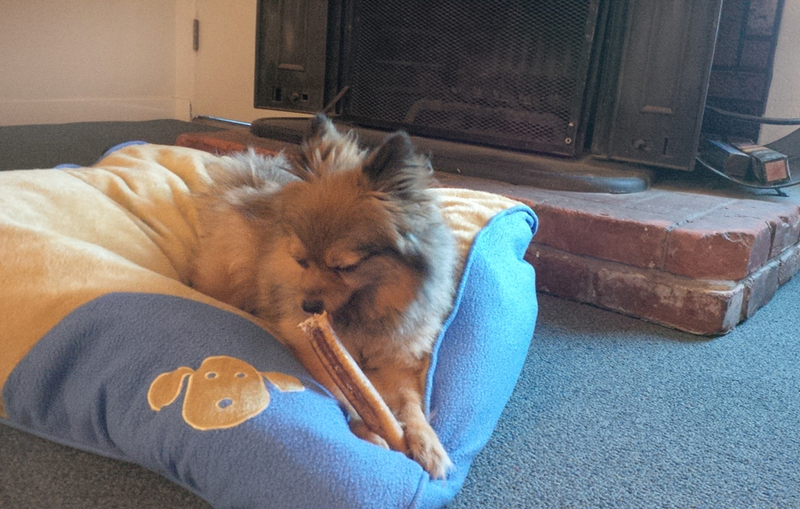 Alfie is crated and we bring his with us when he travels, but to our surprise he hopped on the plush dog bed in front of the fireplace to chew on one of his bones that we picked up in Carmel at Diggity Dog. 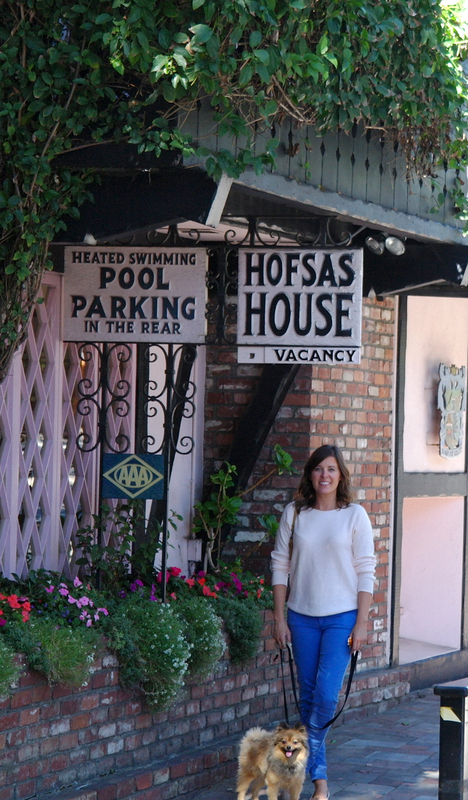 Carrie Theis started working at Hofsas House with her Grandmother Donna Hofsas, the founder of Hofsas House over sixty years ago. Carrie has since taken the position full time and moved to Carmel to run Hofsas House. You can tell she takes great pride in not only the business aspect of Hofsas House, but she truly lights up, talking about Carmel. She gave us many suggestions as to what to do while we were in Carmel along with supplying us with wine walk tour tickets, and reservations to The Grill, a fantastic restaurant where we had a delicious 3 course meal, which I’ll talk about in an upcoming blog post. Our impression of Carrie is that she doesn’t care just about the business she runs with the family, but more about the village itself. Out of the 38 rooms on the Hofsas House property they are each decorated differently. Looking past the retro feel to the room we had, it has its charm. The room itself was huge and we had a lot of extra space which felt comfortable. I got sparkly eyes looking out the Dutch doors in the morning when I realized the view we had. There’s nothing like waking up in the morning and taking in the Pacific Ocean air. It’s clear I missed the ocean living in central Canada for a number of years after growing up in Newfoundland. Saturday night we were completely wiped from our day adventure to Point Lobos where we had a picnic lunch provided by 5th Avenue Deli. We hadn’t planned on staying all afternoon until the sun set, but the place was more breathtaking than we had imagined. More on that spot soon! I loved the hospitality we received from Carrie and everyone at Hofsas House last weekend. Since we are so close to Carmel, we’re excited to return sometime to explore the other areas we didn’t get a chance to. Big Sur is definitely on our to-visit list, along with a trip to the neighbouring city, Monterey. 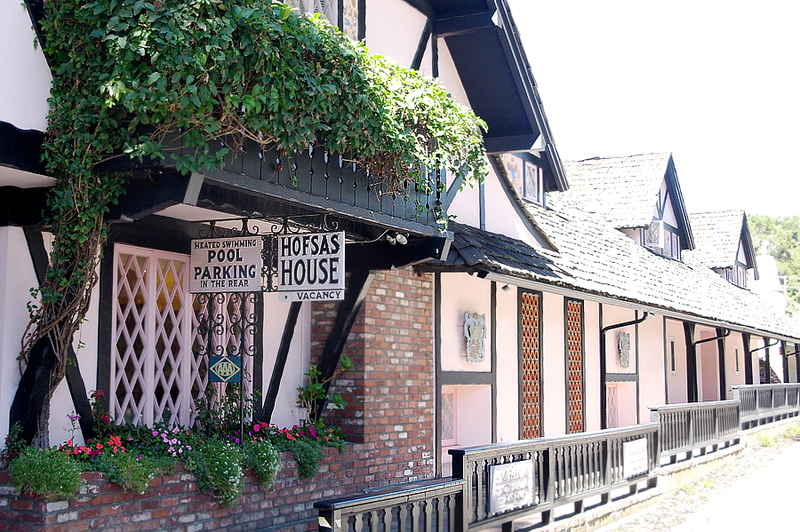 Our stay was hosted by Hofsas House, however the opinions in the blog post are 100% my own. Oh man this looks so wonderful! A great little honeymoon getaway! :) Love the german look of everything AND that they are pet friendly! I can’t believe the Hofsas House is still there. I think they’ve upgraded the experience since I was there “oh so long ago”. Looks like you had a lovely time. 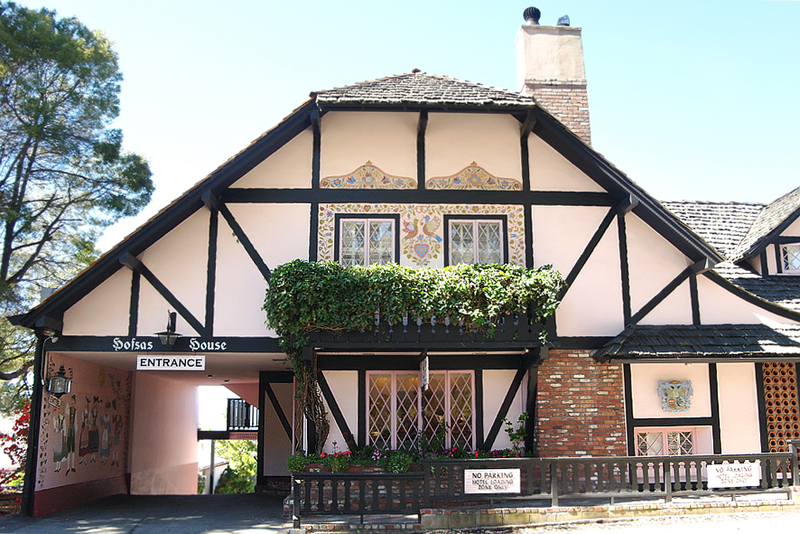 Love how cute Carmel- By the sea is :) The photo of you and the pup at the door is SO cute. haaha. We love being able to take our dogs on trips with us occasionally. The picture of Alfie in the doorway is just too cute. What a romantic weekend! I’m jealous! looks so romantic!! i want a second honeymoon now! :) that’s so nice that you could bring your dog along with you. OH man I want to stay there! My husband and I went to Monterey during our anniversary weekend and I missed Mochi so bad. This is good to remember for our next trip! What cute surprises the staff left for you! What a romantic little getaway in a beautiful place. Love, Love, Love the sound of this place! And I especially enjoy the fact that they are pet friendly! What an awesome place to spend a honeymoon! This sounds amazing! I love quaint family run places like this! The cosy fire is the icing on the cake of that gorgeous split stable-style draw! Aw, that looks like such a great little getaway! Hofsas house looks awesome! Sounds like a fun getaway! Beautiful location! Wow what a beautiful getaway! Love that your puppy can go too! This is so beautiful and probably much-needed! Congrats! I have passed this place a million times and have always wondered what it was like inside – adorable. And I love the fact that you included the “family” photo with the Hofsas granddaughter. You always have the best photos! and your dog is just too cute! It looks like you had such a good time, Carmel is def. near and dear to our hearts. 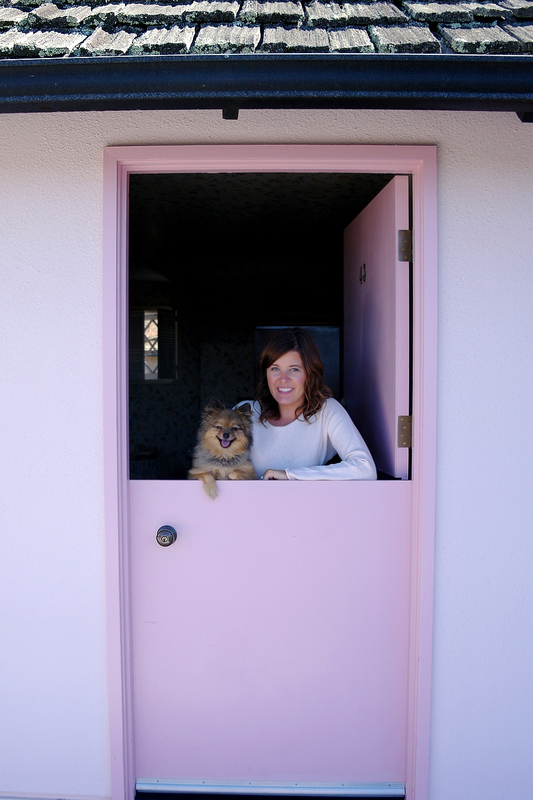 I LOVE the photo of you in the pink door frame. Jessica Doll recently posted..Meetup in San Francisco + Win $500! How romantic and so beautiful. Now I want to go there! @Susan @ 2 cats & chloe: I think it’s crucial (for someone like my husband & I) to find a pet-friendly place. We hate leaving our lil’ bud with anyone. We miss him too much! 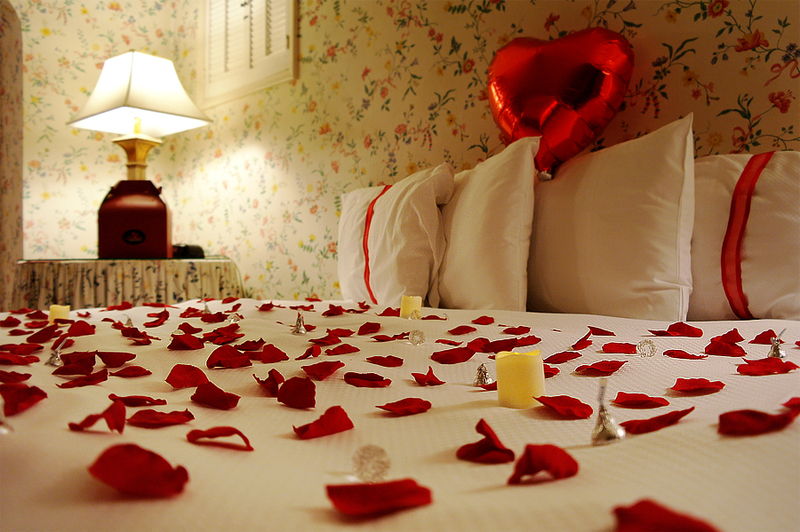 That looked like the most romantic honeymoon EVER! I really want to try a bed and breakfast ASAP as I’ve heard nothing but good things about them. It seems the families that run them aren’t just in it for the money but because they really love the business. Thank you for sharing! Beautiful and romantic. How much fun. 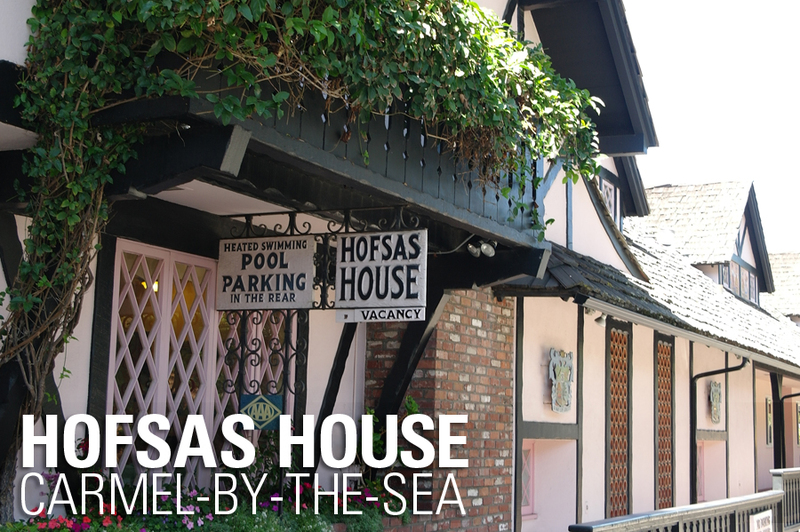 Hofsas House is definitely a must-stay place while visiting Carmel-by-the-Sea. It’s family owned thus you’ll always feel the personal treatment and attention to details. Next week is their 70th birthday! and last week was Carmel’s 100th birthday. Lovely destination for sure.